Creamy chicken and gravy in the slow cooker is like making a plate of diner comfort food at home. It is so easy to make and will make you feel are warm and full inside! I really try to vary what we eat for our weekly family dinner. With the weather warming up a bit I thought I would make one last slow cooker full of comfort food before we get the grill out. Nothing says comfort food like gravy and biscuits. When I came across this recipe for chicken and gravy. I also made a recipe for buttery sour cream biscuits that I thought would be great underneath. Silly as it may sound, not everyone in our family loves biscuts, so I made some noodles to go along with it as well. The chicken and gravy is really good. I'm sure I will be making it again. Kristie has already requested the recipe, so I know this will be made by her also. She said it's even better reheated the next day. MiMi made this for the blog back in 2015. It was a hit with the family then and has been made quite a few times since then. It was good on the biscuits and on the noodles. We have served it on buns as a sandwich and on a slice of white bread as an opened faced sandwich. My favorite way to serve it though, is on mashed potatoes! We liked this recipe so much that we made it to serve on buns for my cousin's bun in the oven baby shower. 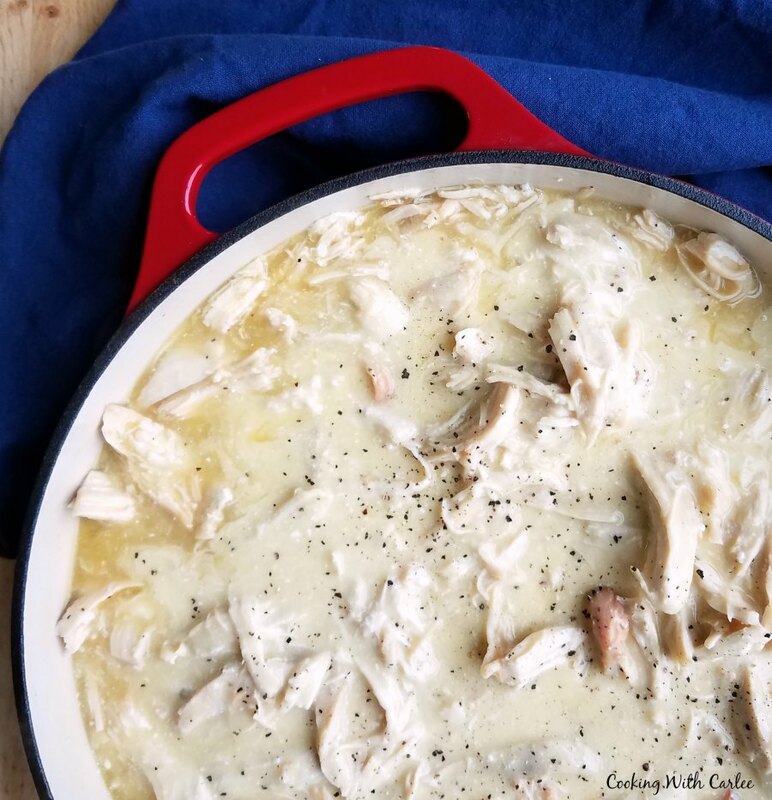 It is definitely a simple recipe to make and a great recipe for an event like that because the prep work can be done ahead and it keeps warm well in the slow cooker for the party! So now the only question is, do you eat the corn on the side or mix it all in?! Rub the chicken with the seasonings. Brown in the olive oil in a skillet. Shred chicken to desired consistency with forks. Stir together corn starch and a Tablespoon of cold water. 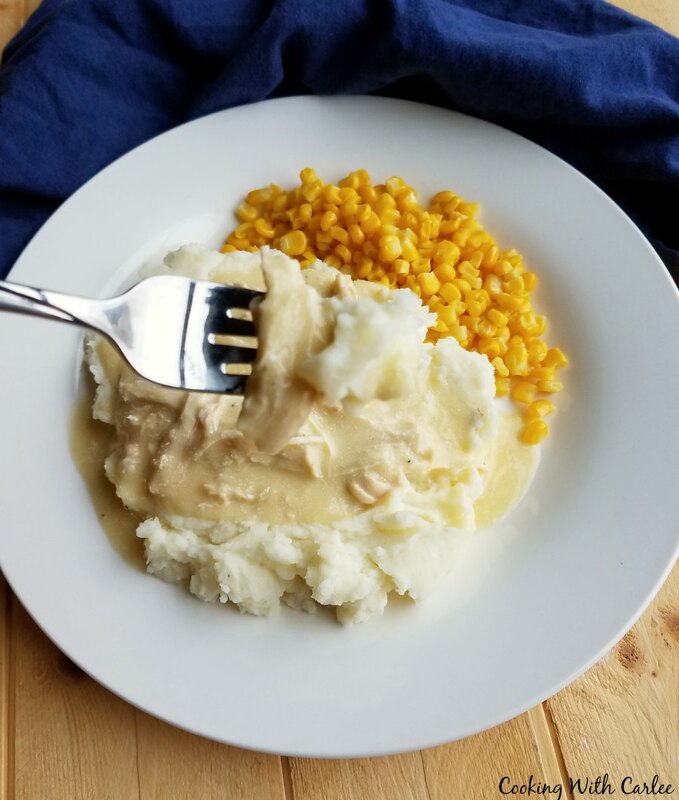 Add cornstarch slurry to slow cooker with chicken and turn to high for about 15-20 minutes or until it starts to bubble and thickens. Turn off heat and stir in sour cream. Season with salt and pepper to taste and serve on rice, noodles, buns, bread or mashed potatoes. Added bonus to this recipe. Your home will smell heavenly. Anybody who enters will know they are in for a hardy treat! It's definitely a great fill'em up meal! This takes me straight back to my childhood! Total comfort food!!! Thanks for sharing on Friday Frenzy!!! It takes me to mine as well <3 Thank you! Thanks for joining Crockpot Monday! 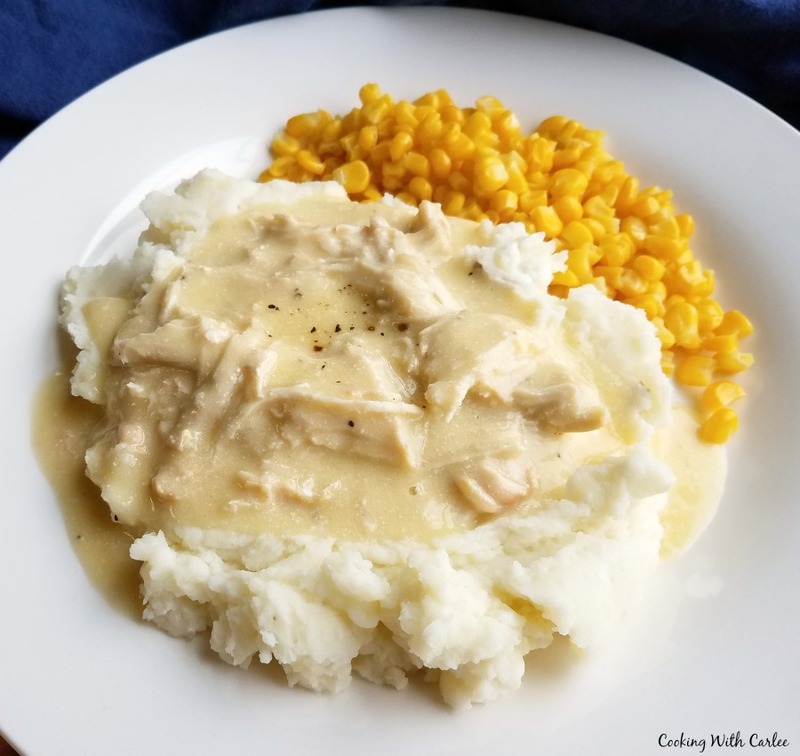 I pinned this yummy looking recipe to my Crockpot Monday Ideas page...this is one chicken recipe that I definitely need to try! oh yes please! 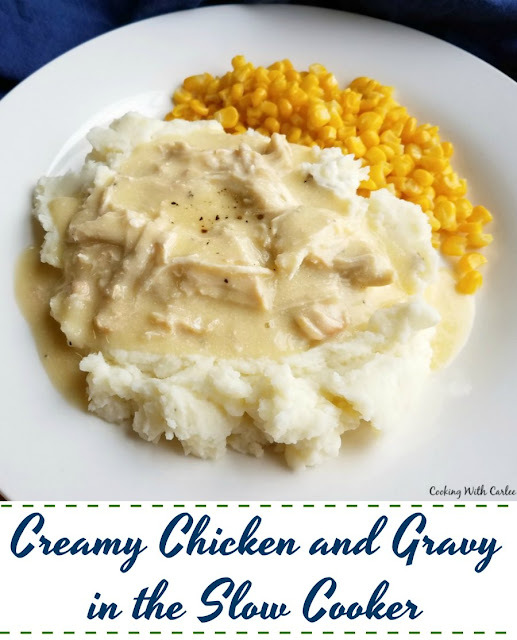 I love a good slow cooker meal and this one is new to me! YUM!! Pinned and shared on the Friday Frenzy page! Thank you so much! This is definitely a warm plate of comfort! Hi Carlee, cooking is obviously in your family genes. My husband would love this on mash! Serving a meal on biscuits sounds strange to me, but I'm guessing they aren't the kind of biscuits I'm thinking of. There is nothing like good old meat and gravy, whether you have it with potatoes, biscuits, or noodles. This dish sounds so good and I like that you used your slow cooker. Sometimes I just want some good old fashioned food! Comforting, warm, filling and delicious... it doesn't get much better!